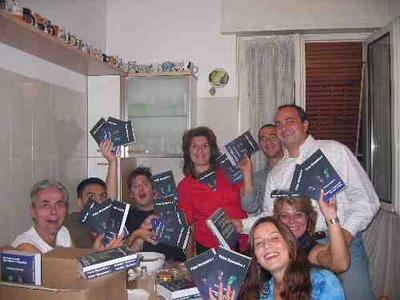 the Italian version of Polar Dynamics 1 is 'pronto'. thank you to all who have helped with this project !!! yeah, the timing is really good - my timing too - because I am the first to not only congratulate to the release of the book but also to your birthday today!! So .... HAPPY BIRTHDAY, BABBA! 13 Sep 2005 @ 00:08 by Ed Dawson @66.245.207.133 : Happy birthday!!!!! I was going to wait until tomorrow, but it just dawned on me that today here is tomorrow there... so HAPPY BIRTHDAY!!!!! Is the Italian version using the exact same cover???? Oh, wait, the subtitle doesn't seem to be there in the picture above. Wow, who are those people in the picture?????? Thank you for giving us the possibility to know you and all your "ambaradan"! and all the "casino" that you do! It is funny to have you around! Tom Waits sung: you have to wait till yesterday is here! A preview of the Polar Dynamics 2???? Tao split into two. One half contained all negative quality, while the other half contained all positive quality. But two is unstable because one can decide that any negative can be a positive, and vice versa. Matter (odi), energy (irosun), space (iwori) and time (owonrin). structures are derived from here. with its survivals, affinities, attachments, etc. No "old yang" or "young yin" here! This is the real level of four. 20 Sep 2005 @ 06:33 by irena @193.2.237.29 : Congratulatuons!!!! Congratulations for Italian version of Polar Dynamics 1 and happy birthday MAX! 23 Aug 2016 @ 08:01 by Tiny Tanks @180.93.27.27 : Thanks for your post! 23 Aug 2016 @ 08:01 by Tiny Planes @180.93.27.27 : Thanks for your post! 23 Aug 2016 @ 08:02 by Carracing Games @180.93.27.27 : Thanks for Sharing! 23 Aug 2016 @ 08:02 by Donkey Kong Unblocked @180.93.27.27 : Thanks for your post! 23 Aug 2016 @ 08:02 by Super Mario Unblocked @180.93.27.27 : Thanks for Sharing! 23 Aug 2016 @ 08:03 by Run 3 Unblocked @180.93.27.27 : Thanks for your post! 23 Aug 2016 @ 08:03 by Run 4 Unblocked @180.93.27.27 : Thanks for your post! 23 Aug 2016 @ 08:04 by Run Unblocked @180.93.27.27 : Thanks for Sharing!